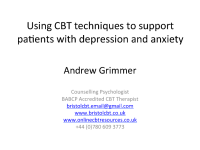 For over five years I have been teaching straightforward CBT techniques to General Practitioners that they can use within the constraints of their practice. The model I use is that of guided self-help or supported self-management, which originates from work done in British Columbia by Dan Bilker and Randy Paterson who wrote the Antidepressant Skills Workbook (free download here). I am very grateful to Health Learning Partnership for providing me with the opportunity to deliver this training. Please remember that these resources are no substitute for a professional opinion or advice from a suitably qualified and experienced mental health professional. The resources and information supplied here are intended to support good practice, not to replace it. In no event will Bristol CBT be liable for any loss or damage arising out of, or in connection with, the use of this website.